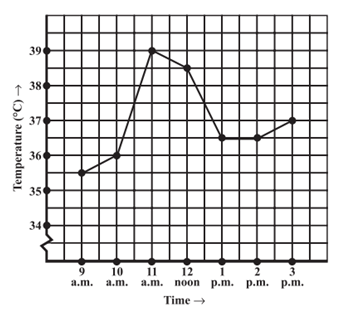 Q.1 The following graph shows the temperature of a patient in a hospital, recorded every hour. 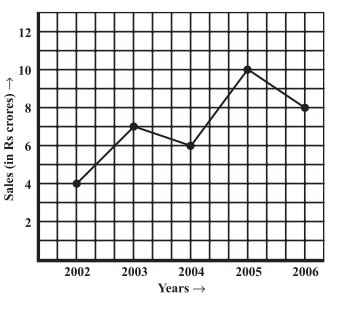 (e) During which periods did the patients’ temperature showed an upward trend? Sol. (a) The patient’s temperature at 1 p.m. was 36.5° C.
(b) The patient’s temperature was 38.5° C at 12 noon. (c) The patient’s temperature was the same at 1 p.m. and 2 p.m.
(d) The temperature at 1.30 p.m. was 36.5° C. The temperature was constant between 1 p.m. and 2 p.m.; hence, it will remain same at 1.30 p.m. too. (e) The periods during which the patients’ temperature showed an upward trend are 9 a.m. to 10 a.m., 10 a.m. to 11 a.m. and 2 p.m. to 3 p.m.
Q.2 The following line graph shows the yearly sales figures for a manufacturing company. (d) In which year was there the greatest difference between the sales as compared to its previous year? Sol. (a) (i) The sales in 2002 were Rs 4 crores. (ii) The sales in 2006 were Rs 8 crores. (b) (i) The sales in 2003 were Rs 7 crores. (ii) The sales in 2005 were Rs 10 crores. (c) The sales in 2002 were Rs 4 crores and the sales in 2006 were Rs Rs 8 crores. The difference between the sales of the year 2005 and 2004 = Rs (10 - 6) crores = Rs 4 crores. The difference between the sales of the year 2004 and 2003 = Rs (7 - 6) crores = Rs 1 crore. The difference between the sales of the year 2003 and 2002 = Rs (7 - 4) crores = Rs 3 crores. Hence, the difference was greatest in the year 2005 as compared to its previous year 2004. Q.3 For an experiment in Botany, two different plants, plant A and plant B were grown under similar laboratory conditions. Their heights were measured at the end of each week for 3 weeks. The results are shown by the following graph. (g) Were the two plants of the same height during any week shown here? Specify. Sol. (a) (i) The height of plant A after 2 weeks was 7 cm. (ii) The height of plant A after 3 weeks was 9 cm. (b) (i) The height of plant B after 2 weeks was 7 cm. (ii) The height of plant B after 3 weeks was 10 cm. (c) During 3rd week, growth of plant A = 9 cm – 7 cm = 2 cm. 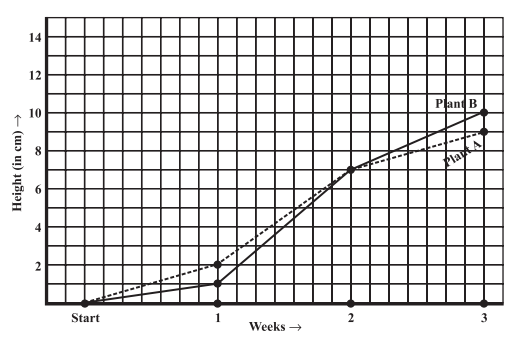 (d) The growth of plant B from the end of the 2nd week to the end of the 3rd week = 10 cm – 7 cm = 3 cm. Hence, the growth of plant A was seen most in the 2nd week. (g) The height of both the plants were same at the end of 2nd week. Hence, the growth of plant B was seen least in the 1st week. 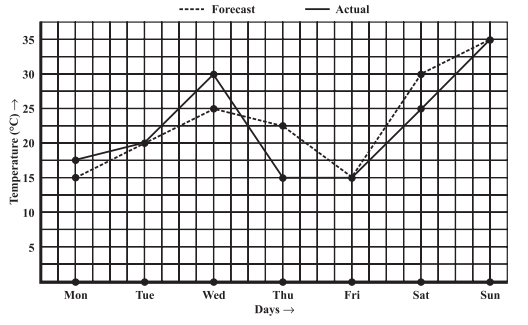 Q.4 The following graph shows the temperature forecast and the actual temperature for each day of a week. (d) On which day did the actual temperature differ the most from the forecast temperature? Sol. (a) The forecast temperature was same as the actual temperature on Tuesday, Friday and Sunday. (b) The maximum forecast temperature during the week was 35° C.
(c) The minimum actual temperature during the week was 15° C.
(d) On Thursday, the actual temperature differ the most from the forecast temperature. Q.5 Use the tables below to draw linear graphs. 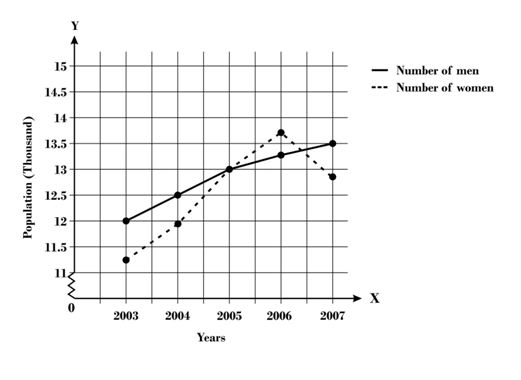 class="table table-bordered table-hover table-condensed "
Here, x-axis represents the number of years and scale taken is 2 unit = 1 year, whereas y-axis represents population and scale taken is 1 unit = 0.5 thousand. Q.6 A courier-person cycles from a town to a neighbouring suburban area to deliver a parcel to a merchant. His distance from the town at different times is shown by the following graph. (e) During which period did he ride fastest? Sol. (a) The scale taken for time axis is 4 units = 1 hour. (b) The person took hours for travelling. (c) The place of the merchant is 22 km far from the town. (d) Yes, the person did stopped on his way from 10 a.m. to 10:30 a.m because no distance was travelled during this duration. 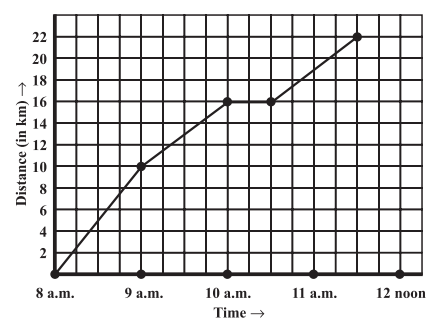 (e) The person rode fastest between 8 a.m. and 9 a.m.
Q.7 Can there be a time-temperature graph as follows? Justify your answer. 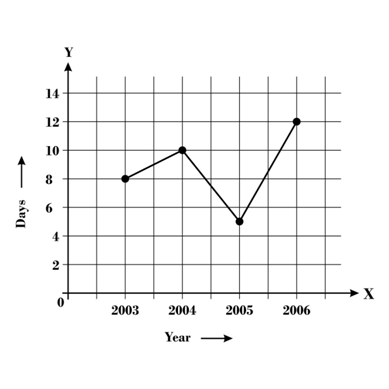 As per this graph, the temperature is increasing as the time increases which is possible. As per this graph, the temperature is decreasing as the time decreases which is possible. As per this graph, the temperature is increasing for the same time which is not possible. 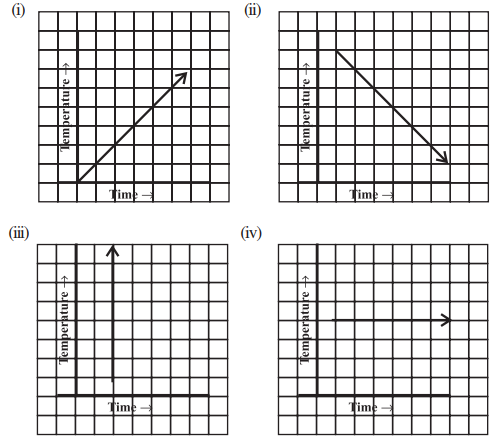 As per this graph, the temperature is constant at the different time which is possible.